↑ 1.0 1.1 1.2 "การประเมินประชากรโลก พ.ศ. 2560". ESA.UN.org (custom data acquired via website). United Nations Department of Economic and Social Affairs, Population Division. สืบค้นเมื่อ 10 กันยายน พ.ศ. 2560. ↑ "The World's Cities in 2016" (PDF). สหประชาชาติ. 2016. p. 11. ↑ National Geographic Atlas of the World (7th ed.). Washington, DC: National Geographic. 1999. ISBN 0-7922-7528-4. 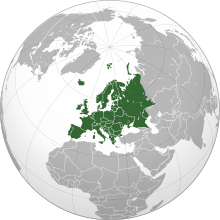 "Europe" (pp. 68–69) ; "Asia" (pp. 90–91) : "A commonly accepted division between Asia and Europe ... is formed by the Ural Mountains, Ural River, Caspian Sea, Caucasus Mountains, and the Black Sea with its outlets, the Bosporus and Dardanelles." ↑ Kim Covert (1 July 2011). Ancient Greece: Birthplace of Democracy. Capstone. p. 5. ISBN 978-1-4296-6831-6. Ancient Greece is often called the cradle of western civilization. ... Ideas from literature and science also have their roots in ancient Greece. ↑ "The European union—a federation or a confederation?" (PDF). หน้านี้แก้ไขล่าสุดเมื่อวันที่ 17 เมษายน 2562 เวลา 11:12 น.